Buying a home is one of the most important investments you will make in your life. That is why one of the first thing my team offers as a Buyer's Agent is a personal consultation on the home buying process. It's important to know about Buyer Agency, financing, choosing a home, making an offer, earnest money, inspections, closing costs and more. We take pride in being a "Realtors, You Will Refer" and hope you'll understand why. With my additional training as an Accredited Buyer's Agent, I have the tools necessary to help you make a wise decision. My real estate team and I will represent you to the fullest as a REALTOR® and adhere to the strict Code of Ethics by which we stand. Investigation of the North Carolina Outer Banks real estate can be a difficult task, especially if you live out of town, out of state, or from around the world. My real estate team can provide that quality contact in the Outer Banks realty marketplace with that “you are there” connection of real estate not tangible long distance. Our firm is also experienced in working with relocation companies such as CARTUS in the relocation of executives. Our philosophy is: MAKE IT EASY for clients and serve them extraordinarily well! Currently, that Outer Banks beach house, condo, or townhouse you wished you had bought years ago may well be within your reach today. 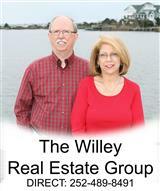 Outer Banks real estate saw its decline starting in 2006. What you can buy today when compared to 2005-2006, may be substantially less. Put my team on the stakeout, for that PERFECT home purchase for you. As an investor in Outer Banks real estate, I know the value of a home in the Outer Banks, having built, owned, and flipped 20+ houses of my own in the Outer Banks, since 1985. It was through real estate that I was able to build wealth. And it is that experience, from those twenty-five years of buying and selling, that I share now with my clients. Additionally, building homes throughout the Outer Banks has brought me not only geographic knowledge of the area, but also contact with community leaders and people with vision. Whether your dream is to buy a home for your family's personal use or to utilize as a vacation rental home, we can help you find the perfect retreat. You may envision purchasing your own piece of these barrier islands to use as a future building site or to hold onto and sell as the land appreciates. Whatever your vision, we are here to intelligently advise you of your options. Homes, Homes and more Homes! With us as your Outer Banks real estate team, you will have full access to every home available in Outer Banks of North Carolina. Every location has different real estate trends and market conditions. The Outer Banks of North Carolina is no different! It's our job to steer you into opportunities and out of traps. We will skillfully create a path from the thousands of houses available to the one that is right for you! Many questions arise during the process of buying a home. Not to worry, we have guided home buyers through it all. We know about the real value and pricing of the homes you are interested in and will ensure that any and every question you have is answered to give you peace of mind. Once you have found a house and want to put an offer on it, is when you really need the strength of a good realtor. You are not alone, we are experts at negotiating terms and ensuring that you get exactly what you want from your purchase. You can be confident that we will double check all the documents and read the fine print, so you won't have to. Call or email us with any and all questions and we will get right back to you. When the time comes for you to make the decision to buy on the Outer Banks we hope that you will choose us to be your Buyer’s Agent. Remember you can get all of our extensive real estate market knowledge for FREE as your Buyer’s Agent! !